Congratulations to all the 4-H participants across Canada who competed in their Regional Fairs, and to all the parents, grandparents and great-grandparents who attended to support the kids and their projects, including 102-year-old Joan Lawrence of Maple Creek, Sask. 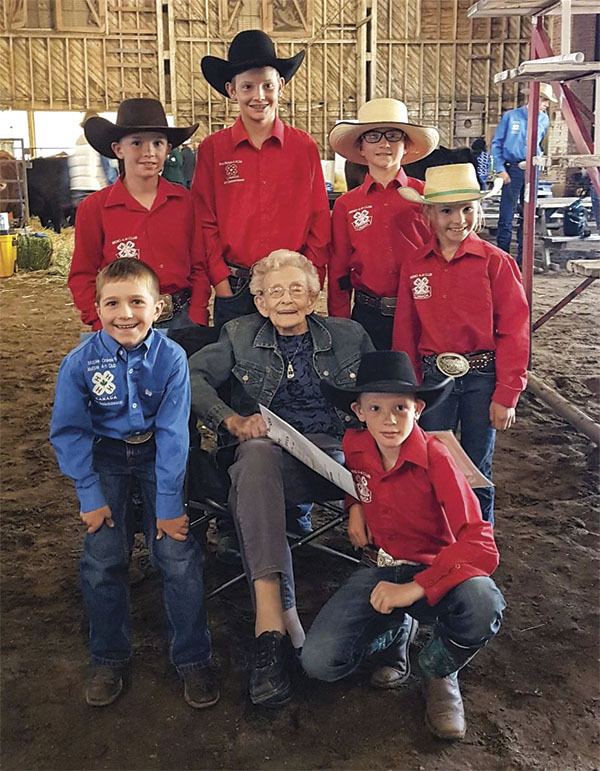 A respected rancher, 4-H and community supporter all of her life, Joan was in the audience cheering on six of her great-grandchildren who were all in town competing in the 4-H Regional Fair in mid-June. Back row, from left: Shay Erickson, Casey Erickson, Sarah Beierbach, Jane Beierbach. Front row, from left: Colt Needham, Joan Lawrence, Rhett Erickson. Joan is also the grandmother of 2015 Miss Rodeo Canada, Christa Lawrence.